My Yearbook class collaborated last week on the ladder diagram for this year’s book. In the course of two class periods, we laid you the entire book and the students take ownership for the sections. And the room was nearly silent the whole time! The screen capture, below, shows the ladder diagram document and our discussion window. Sometimes, a student would speak to the group and other times he would type a request. Not that we needed the chat feature when we were all in the same room…but there was one thing I loved about it — off topic chatter happened in the chat window, not out loud. The spreadsheet updated real-time with student edits. I love this feature! All my students could watch the spreadsheet change as one student added a cell. Enough introduction — on with the tips! Ingredients for this recipe: A class full of students, individual Google accounts, one Google Spreadsheet started by the teacher. They’ll find the discuss feature on their own. Discussion (the instant messaging right there in the spreadsheet or document) is a great way to give some time to different interaction styles. Quiet students who type well may become quite assertive when typing! Every student is assigned a color when he/she enters he collaboration. When a student selects a cell, his/her color is shown around the cell. Avoid stepping on each other’s toes by following the colored boxes. Instruct students to avoid chaos by discussing a change, then making it. If six kids go to change cell A5 at the same time, you might have some ugliness on your hands. I tell my kids to use the discussion area to propose a change, get consensus, then make the change. 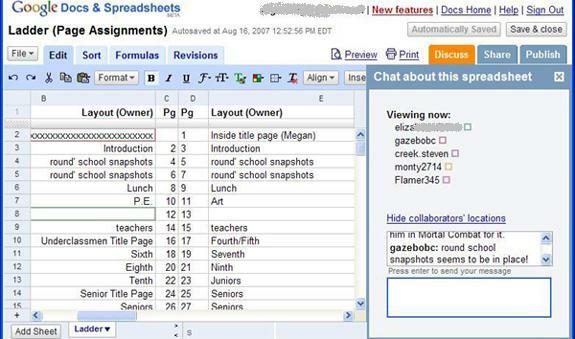 Practice collaboration in the classroom when everyone’s physically present before trying it with remote users. The learning curve will proceed faster. As the teacher, don’t worry about students really messing up the file — you can always roll back to a previous version with the “Revisions” tab. My class’s experience with Google Docs & Spreadsheets was incredibly positive. It’s the first time I’ve had an entire class (yeah — I know my classes are smaller than most) contribute to building an electronic document at the same time. In the past, gathering the kids around a monitor meant the typist had the most input and everyone else was barely with us, attention-wise. This entry was posted in software, web2.0. Bookmark the permalink.